Each week during the 2009 NFL season, Sports Then and Now will pick one NFL matchup and look through the history books to find an intriguing past meeting between the two teams. We will recap the game and hopefully help reintroduce (or introduce for you younger readers) you to some of the greats (and in some cases not so greats) from the history of professional football. Thanks to the decision in 1995 by Art Modell to move the beloved Cleveland Browns to Baltimore a decade after the Colts left in the middle of the night for Indianapolis, Cleveland and Baltimore are forever linked and more than a decade later there is still resentment and anger among some long-time Cleveland fans. This week as the Baltimore Ravens and current Cleveland Browns are preparing to do battle, we look at a game between the two predecessor franchises in those two cities. 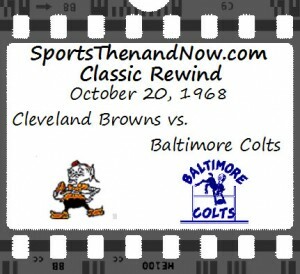 The Baltimore Colts and original Cleveland Browns had some classic confrontations during the 1950s and 1960s. But their regular season meeting during the 1968 season is one of the most noteworthy. Series Record: Between 1956 and 1983 the Browns and Colts met 15 times with Cleveland holding a 10-5 series advantage, including wins in their final five meetings. The two teams met in the playoffs three times, with Baltimore holding a 2-1 edge. However, Cleveland defeated the Colts 27-0 to win the 1964 NFL Championship. There were some other memorable moments in the series including a 38-31 Cleveland victory in 1959 in which Jim Brown rushed for five touchdowns and Johnny Unitas passed for four scores. In 1978, veteran running back Calvin Hill caught three touchdown passes to lift the Browns to a 45-24 victory. Two years later, Bert Jones led the Colts on a furious fourth quarter comeback that fell just short in a 28-27 Cleveland victory. 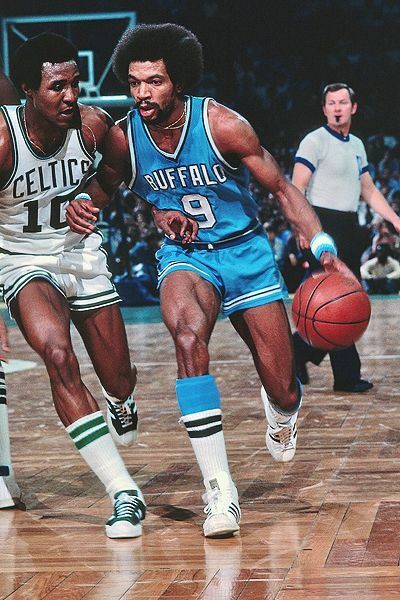 However, of all the meetings, the 1968 matchup is the most interesting and worthy of a Classic Rewind. 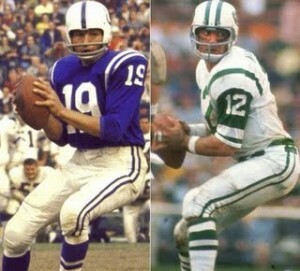 Johnny Unitas and Joe Namath each personified an era in Pro Football history. “I Can’t Wait Until Tomorrow…’Cause I Get Better Looking Every Day“…words to live by. I was a 10-year-old farm boy when Joe Namath signed the biggest contract in pro football history. The war between the AFL and NFL had reached its apex, and the news of Namath’s choosing the upstart AFL traveled far and wide—even to our local weekly, the little ol’ “Reidsville Review” down in Carolina. At that point in my life, my knowledge of professional football was gleaned from family gatherings around a huge woodstove on Sundays and an occasional peek at a snowy black and white TV that the men huddled around after church…as long as I was quiet. Out of those bull sessions, I surmised that Johnny Unitas and the Baltimore Colts were, and always would be, the greatest group of athletes in the history of the game…forever, 1958’s “Greatest Game Ever Played” being the benchmark against all who would challenge their superiority. The Best Game Ever has a special place in the reviewer's library. So writes Mark Bowen, author of The Best Game Ever. 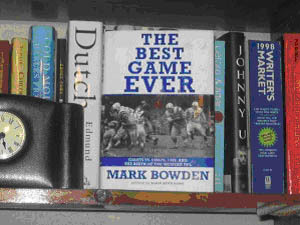 With an eye for detail and a flair for stating the dramatic in a sufficiently understated way so as to make it more dramatic, Bowden weaves the story of the game many still say is the greatest ever played.